I moved to Canada from the Philippines, rather half-heartedly, in 1999. I started out in Edmonton, but was soon offered work in beautiful Banff. The excitement and wanderlust tugged at me — I thought: "I would love to be a nanny for three kids in the mountains!" It was only after accepting the job offer that my new employer showed me where I was going on a map. It was nowhere near Banff. In fact, it was nowhere near Alberta. I soon realized the woman on the phone had said Baffin Island. I was on my way to Nunavut. I remember looking out the window as I flew north that October day in 2000, slowly losing sight of anything green. The landscape was changing from bustling roads to rolling hills and brown-white tundra. There were no trees. It was like riding a roller-coaster, not knowing when the drop would come. My main worry was not the job. I had grown up surrounded by fragrant pines and towering mountains, and I was going to a place that apparently had neither. Was there apprehension? Definitely. But the knot in my stomach also signalled something else: excitement and eagerness to face the unknown. The first few weeks were eye opening. My employer, Anne, understood that I was suffering from culture shock. After all, I had only been in Canada for a little over a year. Anne's introductions made adjusting easier. First, she introduced me to one of about 15 Filipinos in town. I was quickly welcomed into the fold and comforted with homemade Filipino food. Anne gave me a history lesson on how Nunavut was created and why, and also opened my eyes to the richness of the land. She would point out the caribou clambering up the hillside next to the house, and the almost invisible fox and Arctic hare blending into the landscape. Many Inuit, when Anne introduced me to them, were as curious about me as I was about them. I think they were amazed at how closely I resembled them, being from half a world away. We also realized that some words in their language and mine were similar. For instance, their word for "five" is "tallimat." In Filipino, it's "lima." All in all, my transition from a person who was "from away" to one who could call herself "Iqalummiut" was slowly taking place. I was determined to return to my chosen profession of nursing once my year of nanny-hood was over. 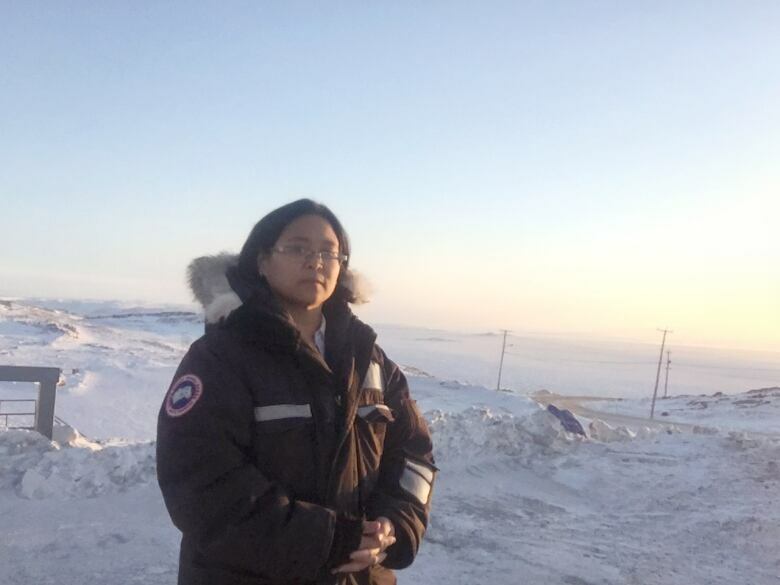 After passing the board exams in 2002, I started working as a nurse in the Baffin Regional Hospital. I have worked in the ward, the emergency room and the operating room ever since. In all these units, I was surrounded by people who had a plethora of stories about life up North. Over the years I met my husband, had two kids and bought a home, much to the befuddlement of my family. I don't think a year has passed without someone asking: "When are you moving to civilization?" At first, the delay was financial. We had loans and a mortgage to pay, and up here the pay is good. However, the cost of living is incredibly high, so money wasn't really the reason. So why did I really stay? I think my first epiphany happened my first winter here. No one knew it was my 25th birthday, but that night, Anne's husband, Neil, took me to the top of the hill overlooking our house. He turned out the car lights and told me to look up. 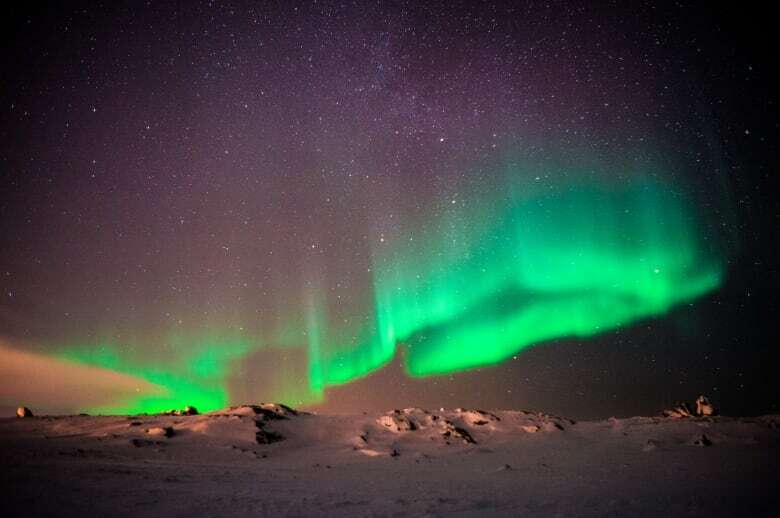 It was the first time I saw the northern lights. A feeling of awe and inexplicable peace filled me, and despite the cold, looking at the lights just made the day melt away. It was like they used their quiet wonder to say, "Hey, you down there: whatever you are doing, know that you are okay. Breathe. Everything will work out just fine". They still affect me that way every time I see them. To me, Nunavut is a true microcosm of Canada, where people from all nations come together and try their best to live the Canadian way. Those who come from all over the world get together and try their best to practice their culture while at the same time making sure it harmonizes with Canadian values, accepting that every culture is different, yet every culture can blend with another without feelings of bitterness and exclusivity. Here in the Arctic you can truly see how immigrants adapt and integrate not just in a new country, but in a culture that even by Canadian standards, is unique in its Indigenous identity. The Filipino population has grown to about 200, and I've also met many people from many other countries — like Lebanon, Nigeria, India — and from every Canadian province and territory. We have a proud LGBT community. Everyone is accepted, and they are all here in the cold, with their parkas, tuques and mitts, with a story to tell. In this small corner of Canada, the cold doesn't permeate the heart. Many came to live in the quiet calm of the North, away from the traffic jams and hectic pace of "civilization." Every time I go on vacation outside of Iqaluit, it takes me about a week before I start feeling the need to go back North. The warmth of the community and lifelong friends win over the chilly winters. And this is why I stay. Pitch your own personal essay to Canada 2017. Do you have a fascinating first-person story about Canada? Is it a point of view that we don't often hear from? Does it present a vision for the future of our country? Get in touch at 2017@CBC.ca for more information about how to pitch your essay. You don't have to be a professional writer — you just need a strong story. 150 facts about Canada… in 150 seconds? !